Trumpeter, Tundra or Mute Swan? 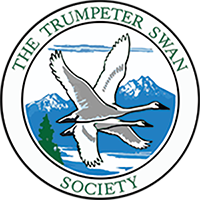 The Trumpeter Swan Society (TTSS) is a non-profit organization, founded in 1968 and dedicated to assuring the vitality and welfare of wild Trumpeter Swans. We are the only non-profit organization working for Trumpeter Swan conservation across North America. Did you see a swan? Learn how to ID your swan. 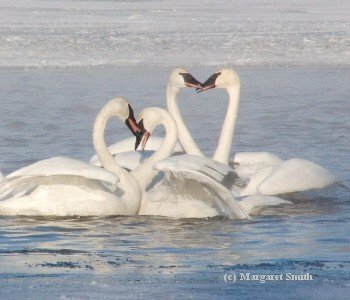 Report your Trumpeter Swan sightings and help us track swan movements and migrations. Check out our FAQs. Learn about swan behavior. 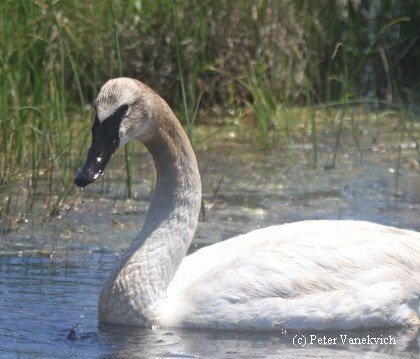 Did you see a Trumpeter Swan in a new area? Help us record swan history as it happens! Use our quick and easy "Report a Swan" online form. Photo by Peter Vankovich - Trumpeter Swan cygnet arrives in North Carolina's Outer Banks. Love swans? Join the movement to help their return and secure their future. Renew your membership. 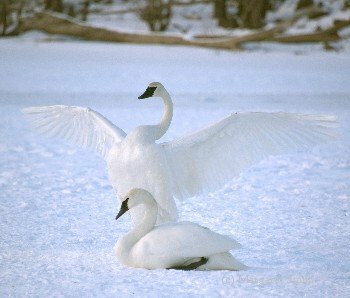 Give a gift membership and help trumpeter swans.